Click on the image to learn more about the HPI. The Genuine Progress Indicator is predicated on objective, economic data. 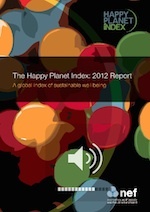 In contrast, the Happy Planet Index (HPI) includes more human elements and attempts to capture more well-being and environmental capacity. The equation of the HPI is quite elegant and easy to understand: A community’s well-being over their lifetime divided by their ecological footprint. That is, how well off can they be within ecological limits. The HPI was developed by the New Economics Foundation based in London and has been applied to the world’s nations, as well as local jurisdictions.